You may think that the deep-fried tempura have oily and unpleasant texture by a hard batter. I can say that you haven’t met the quality of Japanese tempura. It’s light as a feather. The ingredients are covered in a batter made from flour, egg, and cold water. High class restaurants are known for using strictly selected fresh seasonal ingredients. Popular ingredients are seafood and vegetables – shrimp, squid, sand borer fish, sweet potato, pumpkin, and eggplant, etc. Chefs spend a lot of time researching the effects of oil, oil temperature and length of deep fried time against quality of the flour. The best way to eat Tempura is sit at the counter facing the chef. “Tempura is best piping hot,” great care is taken in order to be able to eat all tempura while still hot. I found this Tempura’s ultimate luxury in Tokyo. I usually eat 4-5 tempuras for a dinner with rice and miso soup that make me full enough. But I ate 8-10 tempuras one after another and still asked for a kakiage bowl (which was introduced on a TV program). The pleasure of tempura’s crispy texture with its aromatic flavor and light after-taste was beyond words. Delicious tempura is a guilty pleasure. I ordered Omakase course that let the chef make recommendations. The chef asks “Is it ok to serve shrimp for next?” or “Do you go for today’s special?” just at the right moment. It is fun. Reservation is strongly recommended for chef’s counter seats. Deep Fried Dishes Pair Well with Rice Bowl food is usually the choice for informal dining. This incredibly popular option enables people offers a quick and satisfying meal. Tempura is a good example for bowl food. Crisp tempura laid over a bed of rice. Unique flavors are combined in bowls. Tempura rice bowl includes two jumbo prawns, vegetables and kakiage cooked with a mixture of sardines, prawns and shellfish on rice at this old-fashioned establishment. Unexpected huge tempura made me laugh. How could I start eating? Tasty sauce (mixture of soy, sake and sugar) offered a good balance of sweetness and saltines and created a perfect harmony between tempura and rice. If you are interested in trying food that appears on this blog, please let us know. We will arrange itineraries to suit your preferences. This evening, we had a Izakaya hopping tour. In the tour, we went to Tempura restaurant. 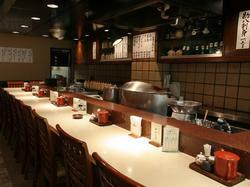 Usually, tempura is more expensive than other dishes, the place in Shinjuku we went was reasonably priced. It is good to eat tempura while watching how they are cooked right in front of us over the counter.